WILLisms.com: Trivia Tidbit of the Day: Part 519 -- New Deal Prolonged America's Depression. Trivia Tidbit of the Day: Part 519 -- New Deal Prolonged America's Depression. The economy is in the tank. The media consensus has somehow settled on free markets and deregulation as the cause of our current woes (which is completely bogus). The logic thusly follows: if free markets and deregulation caused the crisis, then we must need a new New Deal (also bogus). The Reconstruction Finance Corporation was established in 1932 to “promote economic recovery” by disbursing billions of dollars of aid and representing the largest expansion of government’s role in the economy to date. Over 13 years, the RFC distributed more than $35 Billion – initially to financial institutions, but then to other industries like railroads, and eventually even to businesses of ill repute (massage parlors, strip clubs). When the government undertook to “promote economic recovery”, unemployment stood at 8 million. Through government seizing the allocation of resources, capital was diverted from more efficient market-allocated uses to less efficient, politically motivated uses. After 7 years of such misallocation, unemployment had actually increased more than 10% (from 8 to 9 million), and after 13 years, an estimated 1/3 of the distributions had been lost to defaulted loans and other write offs. Precisely at the moment we need to be injecting more freedom into economy and making our country more competitive in a global marketplace, we're poised to burden ourselves with trillions of dollars of dead weight big government spending. It's a disturbing development. For a great assessment of FDR and the New Deal, I can hardly recommend Amity Shlaes' The Forgotten Man: A New History of the Great Depression highly enough. Previous Trivia Tidbit: Median Household Income NOT Stagnant. I have a feeling it is going to get much more disturbing over the next several years. Not good! 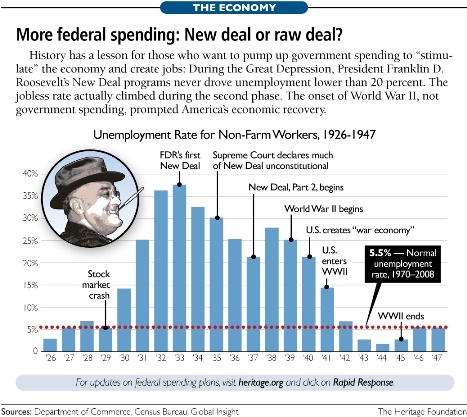 All of FDR's time in office was taken up by a great depression or a world war. If our new president has any sense, he will avoid imitating FDR. Trouble is, BHO is even more liberal than FDR. Wow! More liberal than FDR is really scary!